My friend Brian, he of raw milk and smuggled French cheeses, lives in a Japanese-influenced mid-century modern home in Pasadena. Approaching the house from the street, you come up a few steps to a large door framed by stained glass windows. Inside the door is not the interior of the house, but a raised, covered wooden deck bridge through a Japanese garden that connects front entrance and front doors. 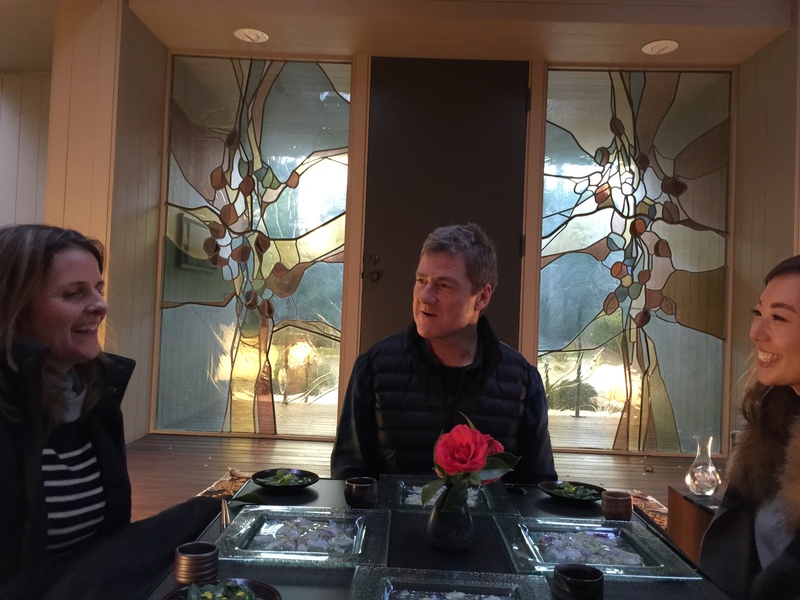 A couple years back, upon our first visit to his house, I commented that I wanted to do a winter kaiseki dinner on the bridge during a rainstorm. I often present friends with interesting home situations with my wild ideas about dinners I want to do there (such as the winter storm seafood dinner I wanted to do at our friends’ Steve McQueen Malibu beach house), but rarely receive more than a polite nod. But Brian seemed enthusiastic. Then — now! — a couple years later, I receive a text from Brian. “We missed the storm! But there’s rain in the forecast for next weekend. Shall we do our dinner?” He didn’t have to ask me twice. It was pouring in Topanga, as if someone had taken a knife and split open the swollen belly of the black cloud above, when we left for Pasadena. But sometimes the rainclouds get stuck on our coastal mountains, and the sky was blue by the time we reached Pasadena. 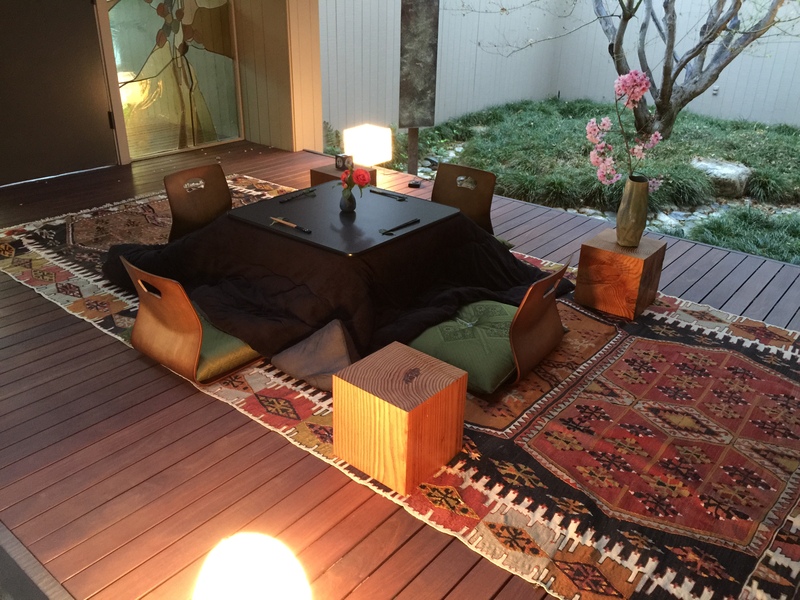 Nonetheless, Brian had set out his traditional kotatsu table onto the bridge surrounded by paper lanterns and plum blossoms, I had brought a bag full of ama ebi, striped bass, wagyu beef, simmered duck and other delights, and we would eat well. The front door was opened not by Brian, but by his new friend Makkie, a very giggly and beautiful Japanese woman. This was a trap, I immediately concluded — like some domestic version of “Iron Chef,” a test of my meddle. You think you’re a Japanese chef, hot shot? I imagined Brian thinking to himself. Try cooking for a REAL Japanese person! 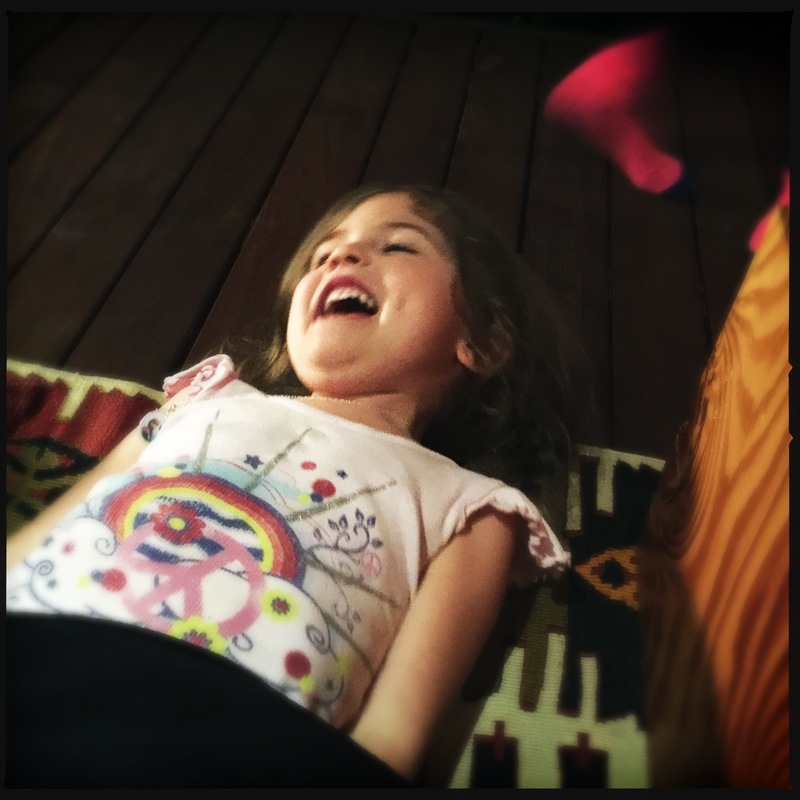 But I didn’t shrink from the challenge — it was ON! I’d cooked French food for French people, Italian for Italians, Mexican for Mexicans… I’d even done chicken Kiev for our Ukrainian friends. I wasn’t easily intimidated. We drank Japanese beer in the kitchen and then moved to the kotatsu. The blue skies had clouded over, and it was drizzling. 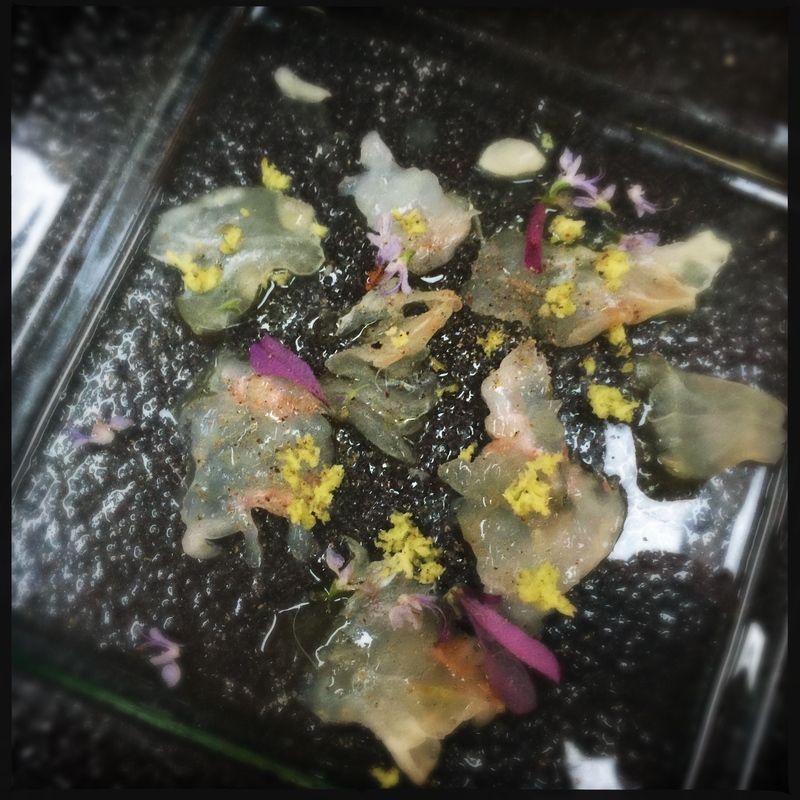 The first course was raw ama ebi sweet shrimp and striped bass sashimi with herb flowers and a salad of greens — miner’s lettuce, sour grass and mustard greens — I had foraged that morning in Topanga. “Oishi!” Makkie giggled, covering her mouth with her hand. Delicious, Brian translated. One point for the challenger! 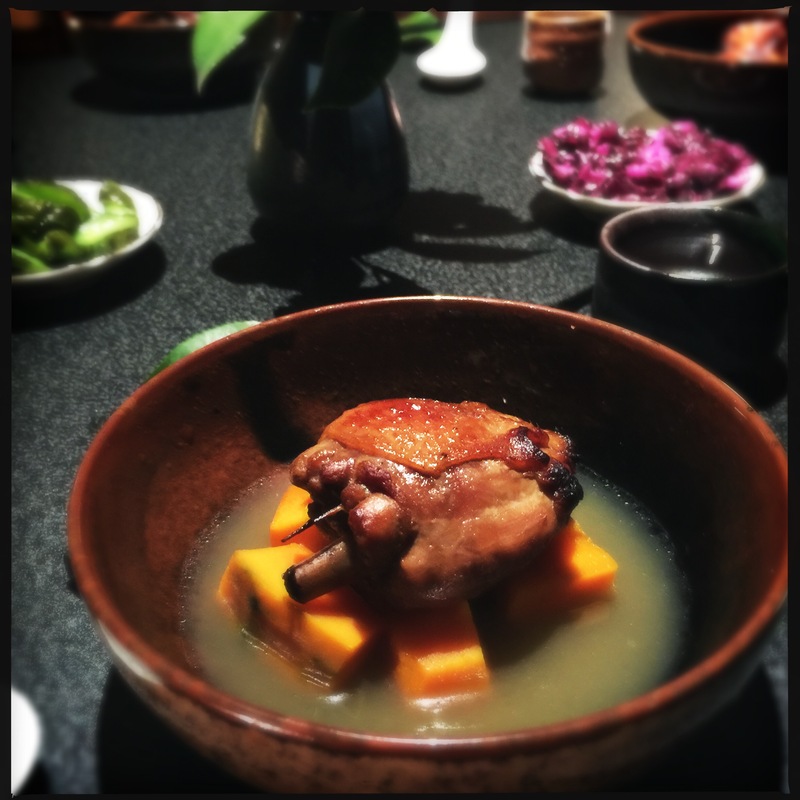 Next we moved on to duck legs and thighs that had been long-braised in apple cider, sake and dashi broth, cubes of kabocha pumpkin lightly cooked in the finished broth. More “oishi,” more points for the chef. From our beer, we had also moved on to sake. Makkie had brought a good bottle, and Brian had several to contribute as well. I once did a post on the evocative names the Japanese give their sakes — “Wandering Poet” or “Mansion of Dreams” — and while I didn’t catch the names of these particular sakes, each was more delicious than the last. By nature, I like to break with tradition. 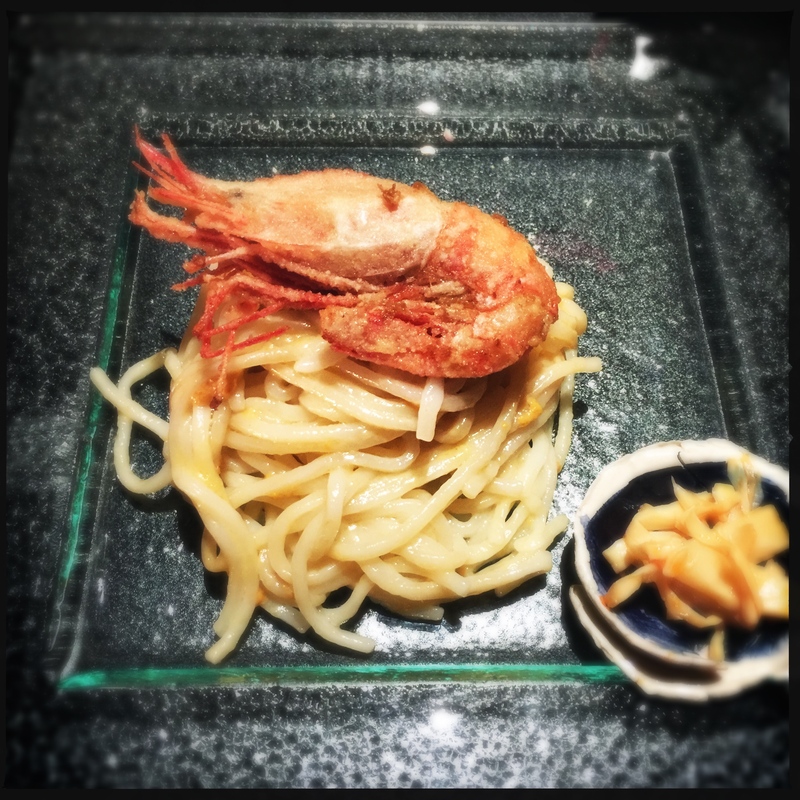 So I took the spirit of kaiseki, with its attention to detail and season, and abandoned the formality. 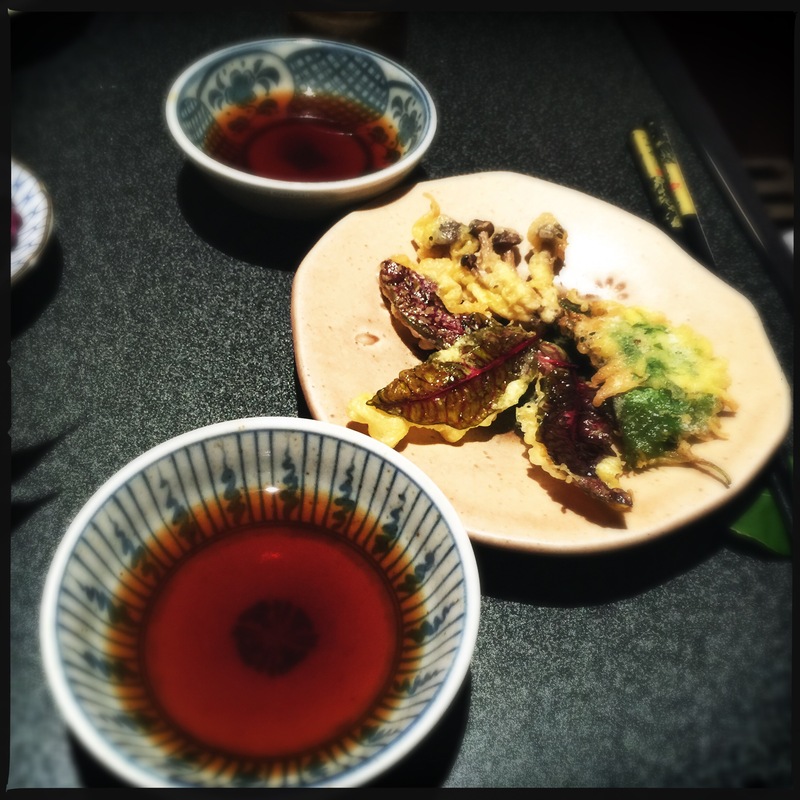 My tempura course — sorrel leaves, wild mushrooms, shiso leaf with sea urchin — might’ve jumped ahead of my grilled course. And where in the instructions does it say anything about a noodle course!?? “Oishi” was my guiding principle for the night. During my preparation of one of the courses, Makkie came into the kitchen carrying plates. She wanted to know how I learned Japanese cooking, where I got my ingredients. She wanted to watch and learn. Yes, I believed, the challenger had won the competition. The promised rain still hadn’t come. 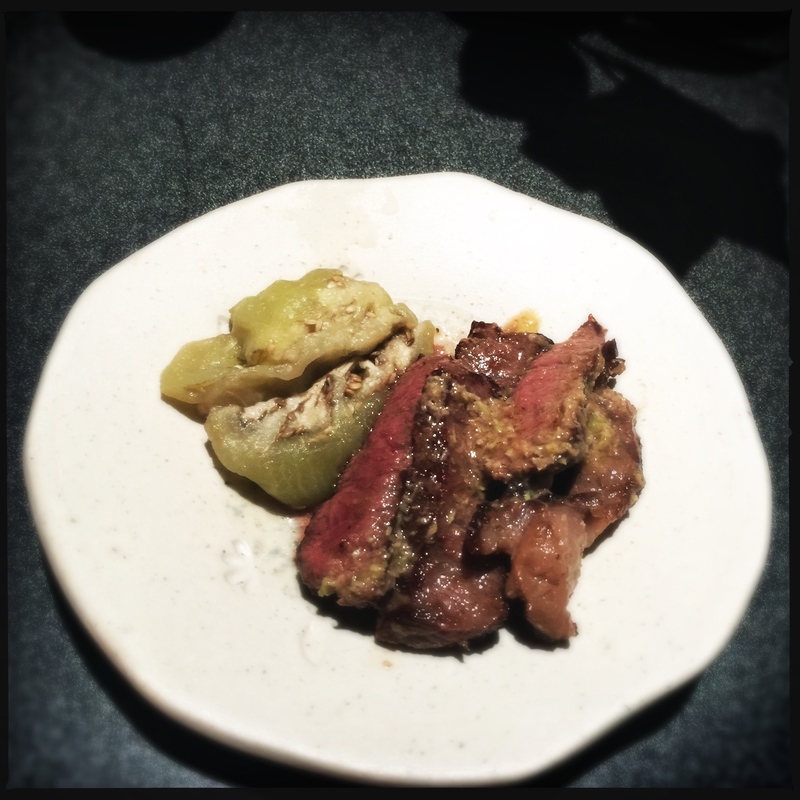 We’d had a beautiful dinner, and after the final course of wagyu zabuton steak with broiled eggplant and fresh wasabi raw butter, we sat luxuriating under the heated blanket that covered our legs. The roar of rain pouring down all around us while we ate was not to be. “It was a test run,” Brian said. The kids were tired, it was time to go home. I was glad someone got to. With a cleaver, remove the knobby bone from the end of the duck leg (chop it off) about 1/2 inch from the end. Chop the leg/thigh into 2 or 3 sections, depending on preference. Season liberally with salt and pepper. In a small saucepan, heat the tsp. oil over medium high until it begins to smoke. Sear the duck, skin side down as applicable, until brown, about one minute. Turn over and sear the other side. Reduce heat to medium and add three liquids. Bring to a simmering boil, lower heat to low, cover and cook for 90 minutes. Place duck pieces under a broiler and broil until golden brown, 5 to 10 minutes depending on heat and proximity to heating source. While duck is broiling, place stock in a small saucepan over medium heat. When it begins to simmer, add pumpkin cubes and cook until tender, about 5 minutes. Scoop some stock and pumpkin cubes into each of 4 shallow bowls. Top with 1-2 pieces of duck and serve. What a brilliant creation, SC. Your setting was perfection, as was this menu. I only know Kaiseki from my reading; I’ve always found the formality of what the dinner must be (in theory) pretty daunting. I’d say you did it just right. 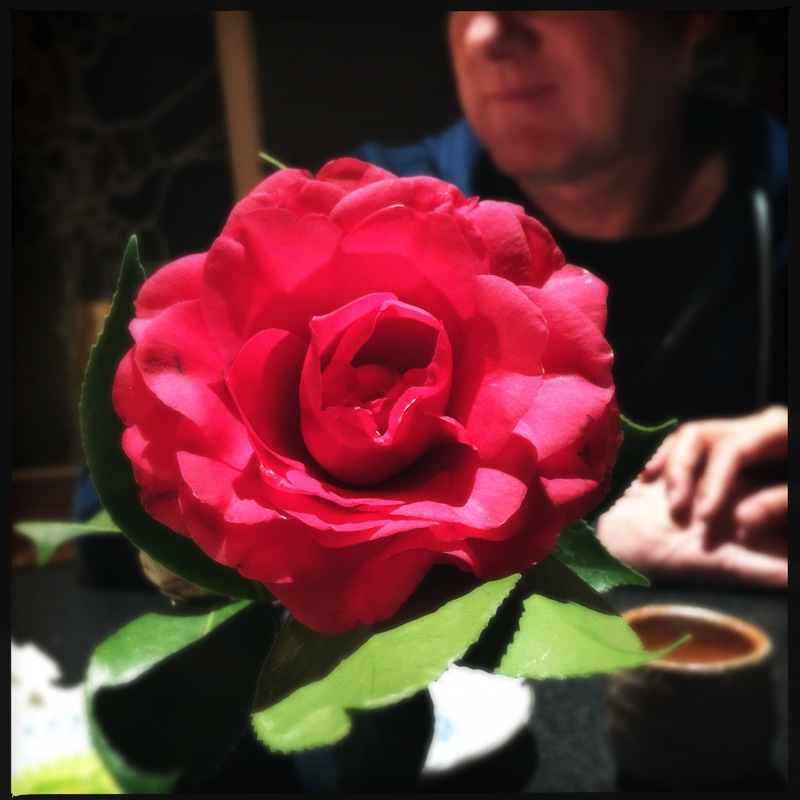 I did live for a few years in LA’s Little Tokyo, though not even the best restaurants in that tourist mecca served such an intricate meal (though I suppose the Otani/DoubleTree could whip one out for a sufficient stack of cash and a large enough party). Getting praise from a true Japanese for your cuisine is quite an honor. The only way I’ve even come close is receiving compliments from Japanese nationals on my manners—which I guess is something. Thank you Tim. It took me awhile to warm up to eating the shrimp heads. But yes, they are the best part. Actually, the combo of the cool, fresh tail followed by the crunchy salty head is something akin to food ecstasy. I went to Japan once on business, and studied up on business etiquette before I left. It was quite the education! Wow! That was all so beautiful. Agreed with Andrea–beautiful dinner and a well written, entertaining telling. One day we eat al fresco by the pool under the overhang in the rain in Winter Park FLA mi amigo. Local source the meal and you chef it and I’ll gladly be your kitchen second hand. I’d be a fool not to accept such a kindly invitation! That was a beautiful post. His table looked AWESOME and of course, your food was amazing! Nice! Good vibe from Brazil! It’s such a joy to read your posts. You have a great writing style. What a fun night! I’ll find some and try, should be rather fun! N.
It was merely a passing association, Eli… And we weren’t nearly as fond of her as we’ve been of his past girlfriend(s). But a fun opportunity for me to test my Japanese chops on a real Japanese person.